I finished the original Mass Effect a couple months ago and it was my first experience with the acclaimed series. Overall, I enjoyed my 32 hours of gameplay and can see what all the hype is about. While I’m taking a break with a couple of other games, I definitely plan on finishing the trilogy before the end of 2018. That said, I thought about writing a full review of Mass Effect, but I realized that so much has already been said about the game in the past 10 years that I probably don’t have much else to add. I will briefly touch on what I liked about the game though, before diving into my biggest gripe with it. Having played Bioware’s Knights of the Old Republic a few years ago, the type of RPG presented by Mass Effect looked familiar in a good way. I thoroughly enjoyed the conversation choices, as well as the full voice acting throughout the game. The story, while linear, did feel like it was decided to a greater extent compared to most games by the player, and that was a rewarding experience. The combat, while different from traditional first person shooters, was enjoyable for the most part. It took a while for me to get used to the whole “you might miss even if you aim perfectly” thing, but a system like that makes sense in an RPG, where better weapons have to improve in more ways than just damage. I did get a little overpowered (I played on Normal) in the third quarter of my playthrough, but the end was plenty challenging and actually required some tactics aside from just aiming and firing. Now let’s talk about my least favorite part of the game and the premise of this post: the bartering system. 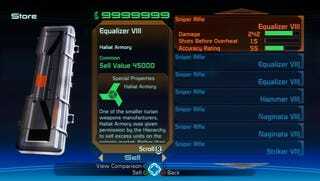 In Mass Effect, it’s clear that selling weapons and upgrades is the player’s main source of income to buy better weapons and upgrades throughout the game. In fact, you even get an achievement if you reach one million credits and subsequently unlock the best weapons in the game. In addition, the game caps your inventory at 150 weapons and upgrades meaning that you have to get rid of your excess as you collect your loot throughout the game. Why then, was it so difficult to sell items?! In the bartering menu, weapons and upgrades are sorted by “level”, the roman numeral number at the end of each item’s name. Within each level, similar items are grouped together, so shotguns with shotguns, armor upgrades with armor upgrades, etc. That’s all the sorting you get; no sorting by sell value, no filtering by type of weapon, nothing. This default sort is frustrating not only because the player often wants to see all of their pistols together when deciding which one to sell, but also because the levels aren’t always a good indicator of the value of the item (for example, a level 1 human light armor could be better than a level 3 human light armor of a different “brand”). In addition, there’s a noticeable lag each type you scroll through weapons and upgrades (at least on Xbox 360), so scrolling through 150 items takes a substantial amount of time. I tend to be an optimizer in games, but I’m pretty certain my level of obsession with being efficient with looting and hoarding in games is not that far from the mean. So generally, my rule of thumb in Mass Effect was that I wanted the three best items of each type, since you control teams of three characters in the game. So I wanted the three best assault rifles, shotguns, pistols, sniper rifles, etc., with exceptions for items such as grenades since I could only use one at a time. Given that I couldn’t sort items in the game’s bartering system, I initially tried the following strategy: 1. Figure out which assault rifles I need to sell and remember them, 2. Go to the vendor, 3. Scroll through all 150 items while trying to remember what I needed to sell, 4. Repeat for every single category. This was clearly not working, and even my wife noticed since over a period of 30 minutes, she would hear “Looking for supplies?” (the Normandy’s vendor’s catch phrase) over and over again. So instead, I had to make a spreadsheet (see above). In it, I listed all of the items I needed to sell so I could go through it all in one pass at the vendor. Instead of memorizing everything, I had my phone out whenever my items were full to keep track of what items I could sell. But the fact that I had to do this chore just to sell my worst items of each type speaks to how terrible the bartering system is in this game! Honestly, it probably added several unpleasant hours to my game time in Mass Effect, and knocks it off the list of my favorite games. I’m sincerely hoping this gets changed in Mass Effect 2 given the critical acclaim for that game; I refuse to deal with this bartering system ever again. Like usual, please visit https://pastimezone.wordpress.com/ if you enjoy my posts and want to see more!